April 30: Morrison (6) and course conclusion. Does Beloved have a happy ending? Three scholars on this question: the motives and the arguments of Alexandre, Berger, Love. Alas: it’s the end! Refresh your memory of the whole with the list of principles. April 26: Morrison (5). Explanations (or non-explanations) of the killing, continued. And: are ghosts real? The question of supernaturalism in Morrison. The monologue sections and the transformation of style in the novel. April 23: Morrison (4). The multiple explanations or understandings of the death of Sethe’s child. Compare Auerbach on Woolf’s “multipersonal” method. Due Monday, April 23, at 10 p.m. on Sakai: a draft page of the second paper. April 19: Morrison (3). Transforming historical source materials and the question of focalization, once again. What is to be done? April 16: Morrison (2). Who narrates the past in Beloved? Introduction to realism (and beyond). April 12: Morrison (1). Putting Woolf and Morrison in literary history: the idea of the literary-historical period. Continuities and transformations from 1927 to 1987. Technique, subject matter, genre. Good basic background on Morrison can be found on the part of the Swedish Academy website devoted to her 1993 Nobel prize. Due Saturday, April 28, at 10 p.m. on Sakai: Paper 2. April 9: Woolf (4). Killing the Angel in the House and the death of Mrs. Ramsay; gender, narrative technique, desire; the meaning of Lily’s painting. 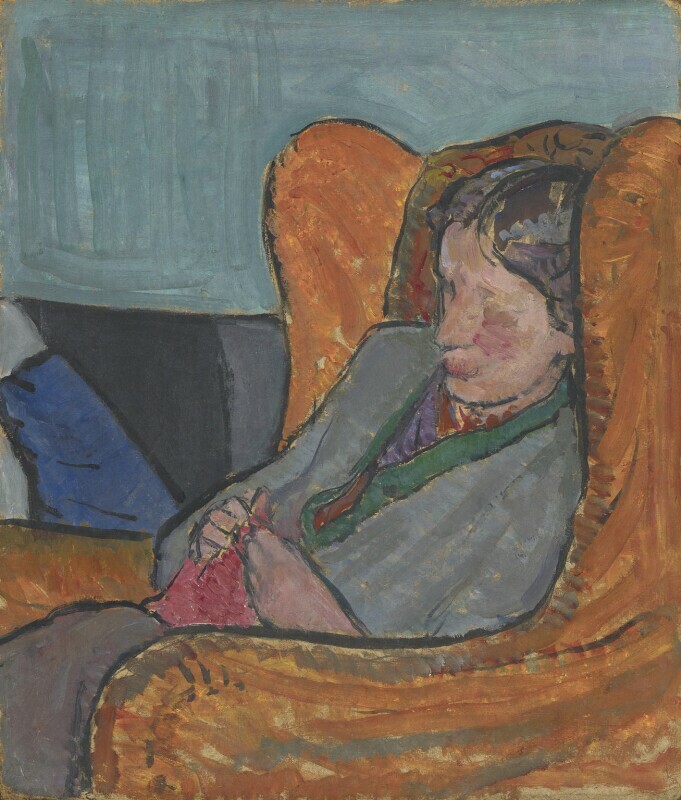 Vanessa Bell, Virginia Woolf, oil on board, 1912 (National Portrait Gallery, London). Due Sunday, April 8, at 5 p.m. in advance of class: Exercise: Responding to Scholarship. Submit on Sakai and bring a hard copy in. April 5: Woolf (3). The passage of time and “Time Passes.” Event, history, change. Narrative rhythm and frequency. April 2: Woolf (2). More ways of thinking. March 29: Woolf (1). (Stream of) consciousness. Auerbach on Woolf. March 22: James (4). Resolutions or the lack thereof. Thematic, narrative, and social contradictions. 1.8 For literary studies, the style of a text is a crucial dimension of its meaning; style is not separable from “content.” The way a text uses the linguistic medium—the way words are arranged and convey meaning—bears both on its generic status and on its specific significance. 1.8.1 The sources of style are many and layered: style may be analyzed as characteristic of a single speaker within a text, of a single text as a whole, of an author (who may have a signature style), of a genre (the formal characteristics of a genre may include a certain kind of style, in which case we speak of linguistic register), of a literary movement, of a social group, or of a historical era. 1.8.2 An analysis of style requires careful attention, at a minimum, to syntax and to diction, sentence by sentence: literary studies considers grammar and lexicon as resources used by texts. 1.8.3 Style also encompasses patterns in the pragmatic effects by which a text conveys meanings not explicitly stated at sentence level. Some of these effects are described as rhetorical figures (metaphor, irony, understatement, hyperbole); others have no widely used names but may be analyzed in context as a relationship between sentence meaning and discourse meaning. March 5: James (1). Focalization. James’s style. Due March 5: Exercise: The medium of prose. A page on an adaptation of Dickens, to be submitted on Sakai by 10 p.m.
March 1: Dickens (2). Adaptation. The film clip shown in class was from The Muppet Christmas Carol, dir. Brian Henson (1992). February 26: Dickens (1). Questions of genre, characterization, and narrative voice. The second side of the handout has both an image of the original 1843 title page and an excerpt from a preface Dickens added later when he included the Carol in a collection of his Christmas Books. Also: brief summary notes on Poovey’s essay on Frankenstein.